Whether you want to marvel over the wonderful Water Gardens of Dorne or explore the captivating walled city of Caceres as King’s Landing, we’ve uncovered 6 spectacular filming locations set to hit our screens during series 7, so you can plan the ultimate Game of Thrones Tour! Better still, they’re just a short hop away in sunny Spain. The three Spanish regions of The Basque Country, Extremadura and Andalusia have been popular spots for the cast and crew of hit TV series Game of Thrones, which finally returns to our screens on Monday 17th July. While these lesser-known gems may not have made it onto your bucket list previously, we’re pretty sure you won’t be able to resist parading around the spectacular castle of Highgarden once you’ve see it on screen! The Basque Country serves up a selection of picturesque beach locations you’ll have to see, to believe. Craggy cliffs, lush green hills and crashing Atlantic waves frame the idyllic Itzurun beach in Zumaia, which is said to be a potential base for The Mother of Dragons, Daenerys and her army of Unsullied. 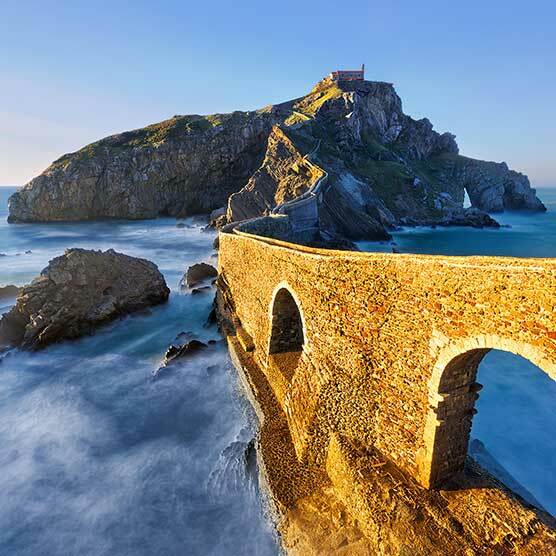 Further east you’ve also got the alluring islet of San Juan Gaztelugatxe, located on the coast of Biscay, Bermeo. This scenic spot is connected to the mainland by a winding, ancient footbridge – so you’re sure to spot a crossing or two once winter finally strikes. It’s no surprise that the gorgeous southern region of Andalusia is due to hit our screens again, but this time with a few new destinations thrown into the mix. The series is expected to revisit the Water Gardens of Dorne, filmed in the amazing Alcazar of Seville, but our sights will also be set on Seville’s Royal Dockyards and The Castillo de Almodovar del Rio in Cordoba – a rather fitting new home for House Tyrell! The series isn’t short of a city setting, with previous destinations including the wonderful walled city of Croatia and ancient town of Essaouira, Morocco. This time around it’s said that we'll be welcoming the Unesco World Heritage Site of Caceres, a medieval location in the western region of Extremadura. Winter may be coming for the GOT cast, but we’ve got you covered if you fancy a slice of the action without facing freezing temperatures – take a look at our sunny Spain holidays and you could be exploring the set as early as next week!